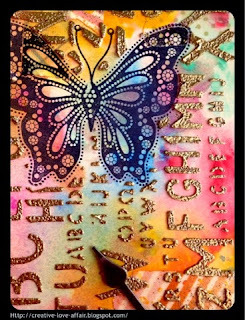 March Tag for Tim Holtz Tags of 2015! 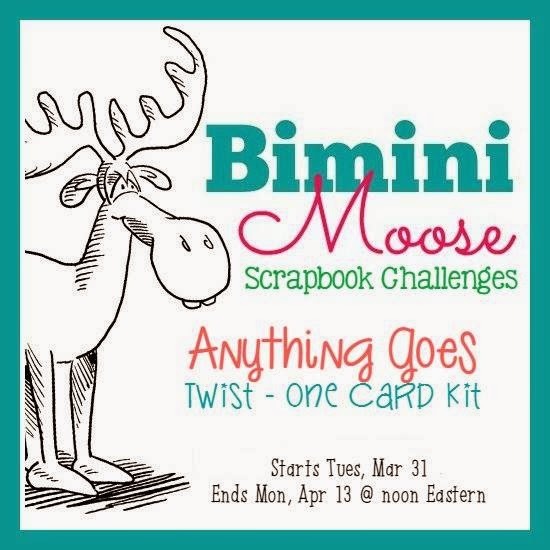 Bimini Moose Challenge - AG with Optional Twist One Card Kit! with an Optional Twist - Use One Card Kit! Our challenges run for 2 weeks. 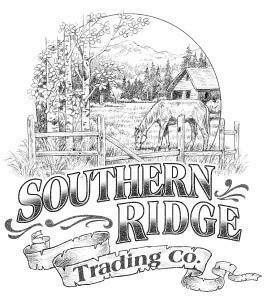 This one will close on Mon, April 13 @ Noon Eastern time - giving us time to pick a Top 3 for the post the following day with our Next Challenge. 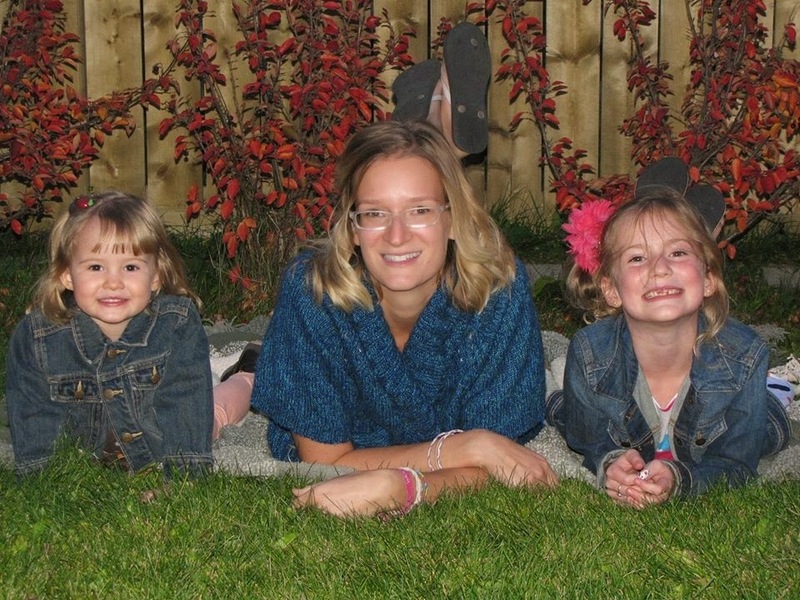 I pulled out some pics from 2010 for my pocket pages today. We went to a Historical Village with some friends for an outing on this day and I thought it would be the perfect layout to use the BoBunny 12x12 page of journalling cards - 'Carnival' (shown below). I really like picking up the 12x12 pages that you can cut up into cards for your pages - it gives you a very low cost way to add something new to your stash of journalling cards! I added in a 12x12 page of patterned paper and used some We R Memory Keepers page protectors. I love the different layouts they have in these protectors! I cut up a pamphlet I had gotten from the park to add into my pages and also added some postage stickers from the same BoBunny line. I even cut up the cardstock that came in the packaging for the stickers! I used pieces from the pamphlet to show which rides we were on and used the front page in a photo collage on this layout. I love the map collaged onto this page! I added more journalling cards and stickers throughout my layouts. This is the cut apart 12x12 - how cool! Thanks so much for joining me!! I love seeing and hearing what you are up to! Remember, you can link up to anything you've created that is Scrapbooking related!! For my project this week I made an Easter card using the sweet Bugaboo Easter Wagon digi stamp, and I layered it over some frames from the Elegant Edges cartridge and used some die cut Easter Eggs, adding some bits and pieces of thread, doily, ribbon and a button. The inside of the card uses the Phrases cartridge for the Happy Easter cuts and I layered it on an Elegant Edges frame. I hope you are enjoying getting ready for Easter this week! 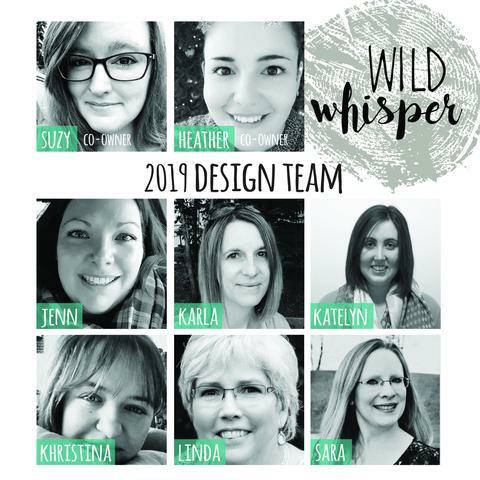 And I hope you will hop over to the Fantabulous Cricut Blog to see more inspiration from our wonderful DT members as well as adding your own Easter Cricut project!! Pretty Cute Stamps Feature - Happy Spring! It's funny how a holiday or special event seems so far away and then all of a sudden you realize you need a bunch of cards in just a few days! Well, I thought I'd get a cute Easter card done and mailed off just in time using the Easter Cuties stamp set from Pretty Cute Stamps and the diecut Easter Basket from Pretty Paper Pretty Ribbons! 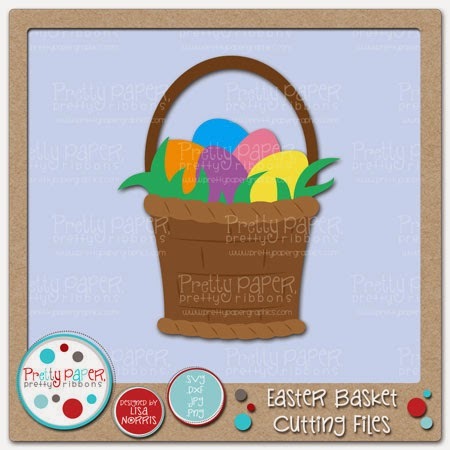 I used some spring coloured papers on my background and for diecutting with my Cricut Explore, and then added some Stickles and a fuzzy ribbon to the basket. I watercoloured the little Easter animals with Tombow and Distress markers and tucked the bunny and duck into the basket. Inside, I used the sentiments from the Easter Cuties set and the lovely Easter eggs that are included. Well, I'm off to mail my pretty card to a loved one! I hope you enjoy your week and get some Easter crafting in. Don't forget to check out all the blog posts on the Pretty Cute Stamps blog over the last week so you can see all the new releases from the March 2015 release!! 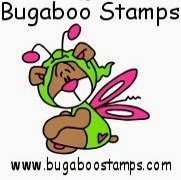 They are on sale until April 2nd at the Pretty Cute Stamps store - so head on over and pick your fav's!! 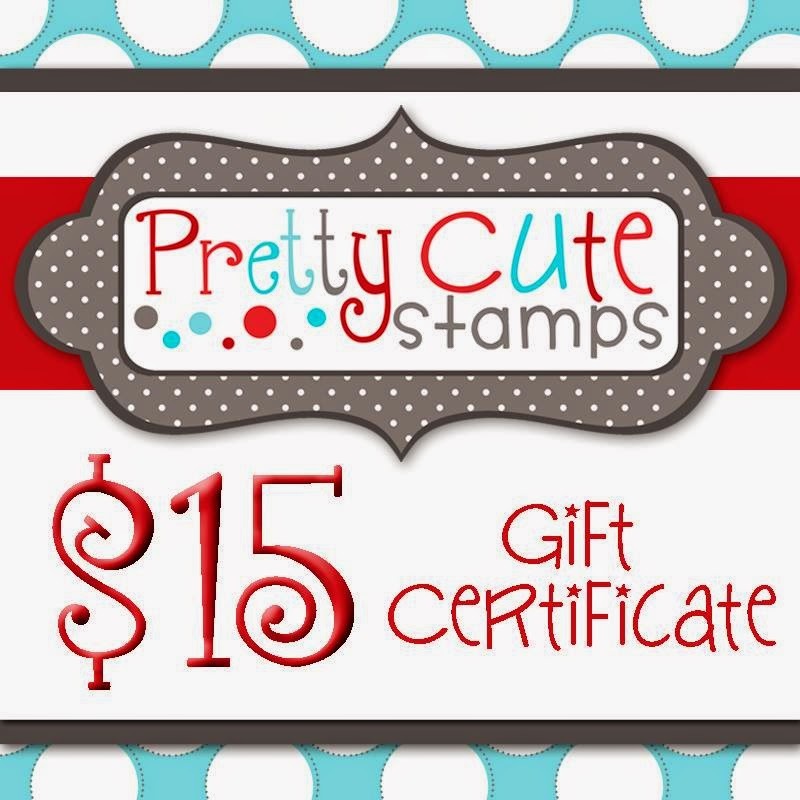 Pretty Cute Stamps March 2015 Release Blog Hop! Thanks so much for joining us for the March 2015 Release Blog Hop, where we are all sharing projects featuring the new stamps this month that are now available in the Pretty Cute Stamps Store. 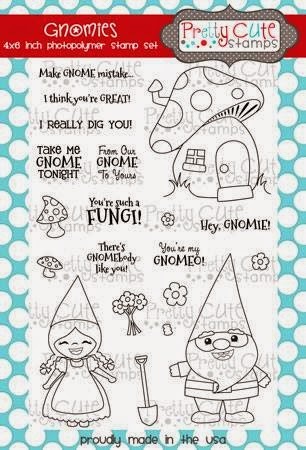 For my project for the hop, I've used the Gnomies stamp set to create this sweet little gnome birthday card! I distressed my patterned paper edges and layered on different papers, twine and a button before adding my diecut paper cut with the Spellbinder's Nestabilities die. 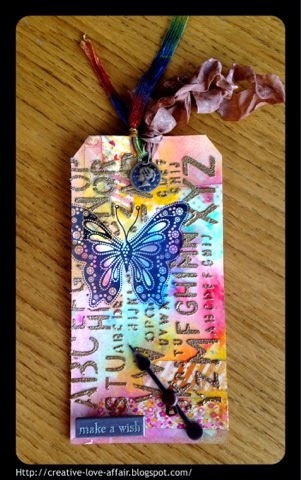 I made a little tag with the smallest of the Nestabilities dies and stamped this sweet sentiment. this would be perfect for a housewarming and even Christmas! Hmmm, this cute gnome may turn into a little elf in my next card! I watercoloured this cute family and their adorable mushroom house using Tombows and Distress Markers on watercolour paper and then layered them using some popdots for dimension. Along with another Gnomies sentiment I added Happy Birthday from the Wish Big stamp set. A random winner will be chosen on Monday, March 30, 2015. 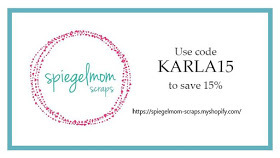 Be sure to check the Pretty Cute Stamps Store to pick up your favorite sets - the New Releases will be on sale through April 2, 2015, and you can save even more by purchasing the March 2015 Stamp Bundle! You can also pick up the SVG outlines for each of these stamps at the store!! Now, you can head over to the next stop on the hop- Dawn's blog. 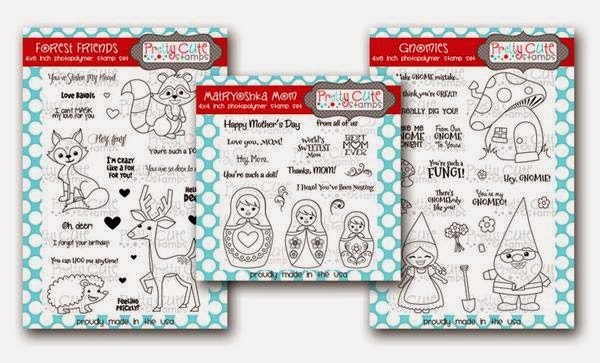 Pretty Cute Stamps March Sneak Peek - Matryoshka Mom! It is that exciting time!! 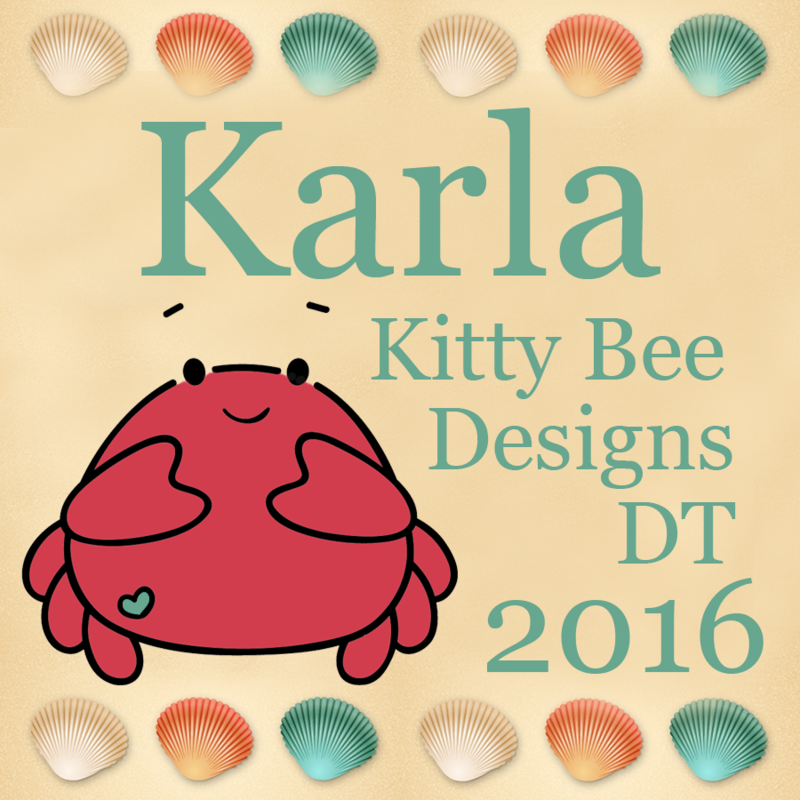 The new release Sneak Peeks for March are previewing at the Pretty Cute Stamps blog! For the next three days you'll be able to see awesome projects made with the new release sets - and then on Saturday you can join us for the New Release Blog Hop where you will see more amazing projects and get to see the entire new stamp sets!! I'm so excited today to use the new Pretty Cute Stamps Matryoshka Mom set!! 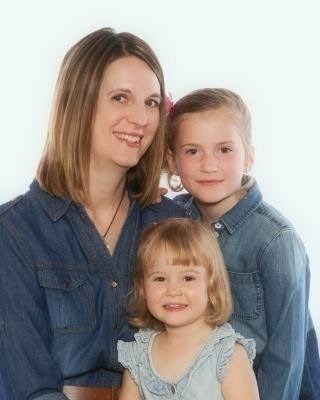 This set is, of course, perfect for Mother's Day, but also a perfect set to use for any sweet girl card you need! I stamped my dolls on watercolour paper and then used Tombows and Distress Markers to watercolour them in. I've been working on reorganizing my craftroom and recently combined both of these markers, and I must say I'm using them a lot more and love using them together! On the bottom of my card I stamped a tag with sentiments from the set, as well as used the beautiful scroll stamps that are also included in my corners and on my tag! I cut out some cardstock and patterned paper with Spellbinders Nestabilties dies and layered them together with some ribbon from my stash, some glittery thread and a flower. 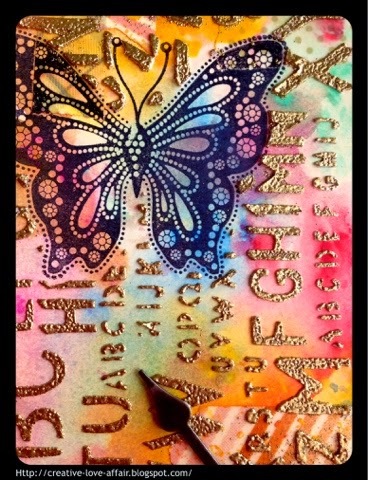 Inside, I stamped more sentiments from this lovely set. I hope you enjoyed this sneak peek of the Matryoshka Mom set! There is still more fun to be had though! If you head over to the Pretty Cute Stamps blog you can see another sneak peek from this sweet set AND there's a free cut file of the Matryoshka Doll available for Wednesday, March 25, 2015! You can also check out the Pretty Cute Stamps March 2015 Release Facebook page event, so you won't miss out on anything! Thanks so much for joining me today!! 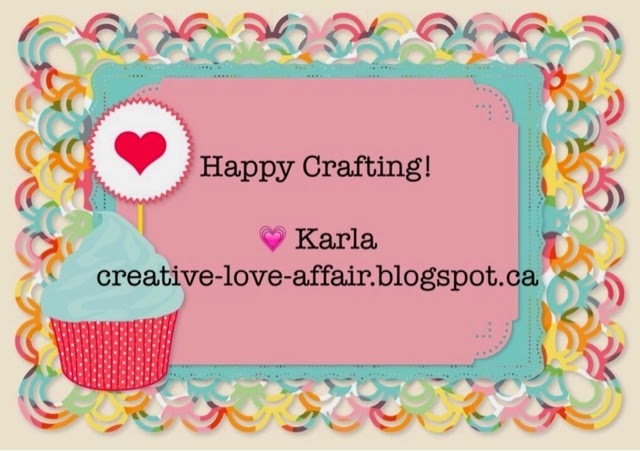 Keep checking back all week at the Pretty Cute Stamps blog for amazing sneak peeks for the March new release stamps and the big Blog Hop on Saturday!! Paper Dolls and Easter Critters! I whipped up a couple projects recently to send off to two girls with swap group I'm in. If, like me, you are finding you're getting less and less 'happy mail' lately - a swap group could be just the thing to get involved in! There are lots of different groups on Facebook that you can sign up for and start swapping cards with other lovely ladies - and I'm sure some guys as well. For my first card I used a Prima Paper Doll stamp by Julie Nutting and paper pieced her outfit after colouring her with Prismacolor Markers. Then I coloured in some adorable Easter critters from the Pretty Cute Stamps Easter Cuties stamp set with Prismacolor Markers and layered them beside this darling girl. 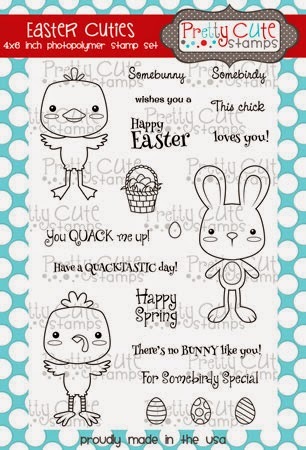 Inside, I used more of the Easter Cuties stamp set - the sweet little chick, Easter eggs and sentiment! For my second project I made a tag for a swap partner who had send me scraps of papers in a 'scrap swap', using papers she had sent to me. I stamped this Prima Doll directly on a brownish patterned paper and coloured in her hair and skin with Prismacolor Markers again. Then, I paper pieced her dress, hairband and shoes and added some stamped butterflies and a sentiment. On the back I added another sentiment and stamps. I hope you had a lovely weekend and are enjoying your week. I'm looking forward to some warmer temps later in the week, but in the meantime I'll use the cooler weather as an excuse to stay in and do a little more Easter creating! I am finding with Project Life I am most happy skipping around a bit - doing what I feel like scrapping at the time and then inserting the pages into my album in chronological order. Kind of the the same way I scrapbook traditionally! I'm finding the first of the year was so busy with a lot of events happening within our weekly schedule - birthdays, shower, wedding photos! I wanted to keep the events together with the PL pages, so as I completed my weeks I also added a couple pages that focused on just the event itself. So, even though I've already scrapped my daughter's wedding I got around to finishing her bridal shower a couple days later. This turned into a 2 page spread (see below) and I love how I could use all the pictures that I wanted from this day, adding it to the end of my 'weekly layout'. I used some journalling cards and some patterned papers cut to 4x6, and I layered over some Valentine ephemera diecuts to add to the 'love' theme. I added some photos of the mixed media bridal shower book I made for her. I used watercolouring, diecuts with the Cricut, stamping and some paper ephemera in this book and then added a few pics of the pages to my pockets. I hope you are enjoying your week! 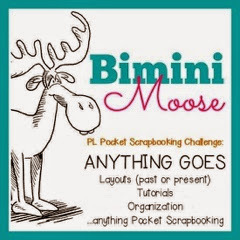 Don't forget to check out the latest Bimini Moose Challenge, Anything Goes with optional twist - Photo Mosaic! 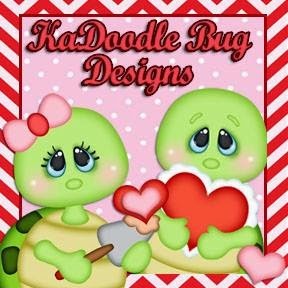 KaDoodle Bug Birthday Hop Layout!! Pretty Cute Stamps Feature - Sushi!! FCCB #246 - St. Patrick's Day!